Remember, kids! Always eat your vegetables. Or they will eat you. While Jeff's hallucinations are definitely an issue, the real problem here is the randomly spawning mole. Just...what is he planning? After a failed attempt at bat, Ness makes with the escaping. This is sort of like pressing rewind on a VCR, only in comic form. Finally setting out, the gang enjoy a nice tune on their way to Threed. Thankfully, the loud music prevents them from experiencing a more...interesting matter at hand. 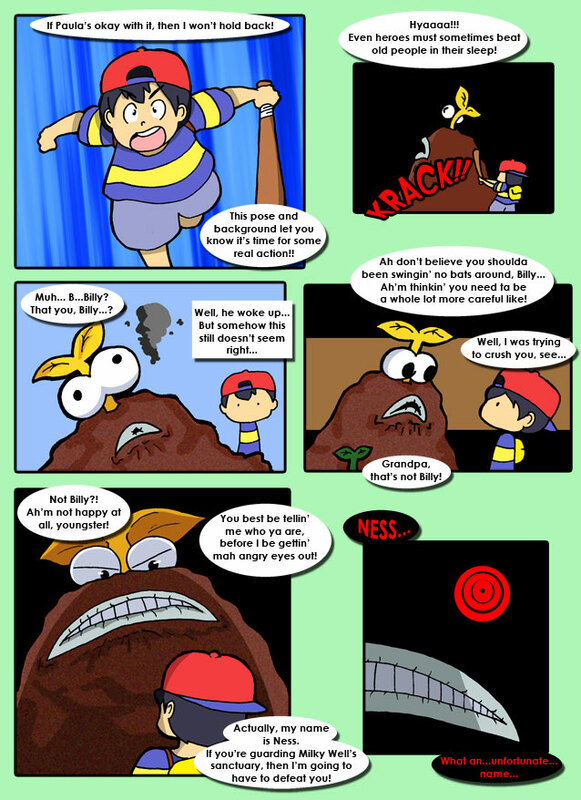 Ness deals a damaging blow to Frank and awakens a sleeping beast. Well, not so much sleeping. More like "hiding in the bushes offscreen" beast. With Bob gone, Belch's factory is as good as unmanageable. To top it off, downing his favorite snack is even a bigger deal than stopping the destruction of his workplace. This guy just doesn't have his priorities straight.